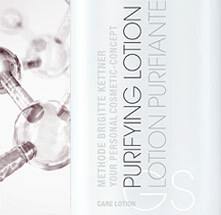 Using the cleansing lotion perfectly formulated for your skin type refreshes and invigorates the skin. It provides the optimal basis for absorbing the active ingredients in the care products you subsequently use. Clarifying lotion/toner for dry and sensitive skin. Clarifying care lotion/toner for normal and combination skin. Hydrating lotion/toner for all skin types.